The search for “the one” can take a lifetime but for people living in Wales, they have reason to be hopeful this Valentine’s Day. According to a survey conducted by OnePoll on behalf of Shawbrook Bank, the quest for love typically comes quicker for the Welsh than for most other Brits. The results of the research reveal people in Wales are the youngest to pop the question with the average age for getting engaged being just 23. The time between people’s first serious relationship and a proposal is also the shortest of any country or region in Britain, just 3 years and 8 months. On average there’s six years between Brits first serious relationship and the day they get married but for those in London this stretches to almost eight years. 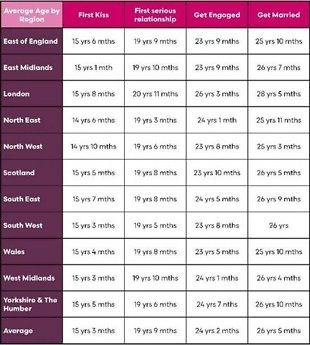 In fact, Londoners are the oldest to tie the knot (28 years and 5 months) while people in the North West are the youngest (25 years and 3 months). Folk in the North West not only walk down the aisle earlier than others, they also have their first baby younger than those from any other region. Plus, the gap between their first kiss and their first child is just 11 years, a whole year ahead of the British average. More than a third (36%) of Londoners wait until their 20s to start a serious relationship, which is the highest percentage in the UK. People living in the capital are also the only ones that on average have a baby before getting married. This is possibly due to the cost of living which is far higher in London than the rest of the UK and could impact on saving for a wedding. However, people living in London, the East Midlands and Yorkshire and Humber are the only ones who buy their first home before getting hitched. The latter are also among the quickest to settle on what could be “the one” as it takes just 4 years from a Yorkshireman or women’s first kiss to their first serious relationship – the joint shortest ‘kiss-to-serious-relationship’ gap. People living in London experience the longest ‘kiss-to-serious-relationship’ gap with a difference of 5 years and 3 months. North Easterners have their first kiss before anyone else (14 years and 6 months) and are also the youngest to get into a serious relationship. Paul Went, Managing Director of the consumer division at Shawbrook Bank says: “The search for love can be a long and winding road but whatever stage of life you’re at, you never know what lies around the corner. Planning for the big moments in life is important even when they do feel a long way off.